The German Society of Maryland and the Maryland/DC Metro Chapter of the AATG joined together on Sunday, May 22, to honor outstanding Maryland students of German at an awards ceremony in Zion Church’s historic Adlersaal. Parents, friends and teachers of about 75 students gathered to celebrate these achievements. Amanda Sheffer, president of the AATG-MD/DC Metro chapter, and Anton Smoot, the president of the German Society, welcomed all to the ceremony. Andreas Gebert from the German Embassy, and Hal Boland, national president of the AATG, congratulated the students. This year the German Society presented awards of $1,000.00 each to three outstanding college students, who are majoring in German. These students are Austin Bourgerie, Thomas Harris, and Andrew Nixon. All three were students at UMCP. The German Society also gave awards of $400.00 to two students who are minoring in German. These students are Jennifer Kahn from Towson University and Caleb Metcalf from UMBC. This is the fifth year in a row that the German Society is giving an outstanding high school student the opportunity to study in Germany during the summer with the AATG Summer Program. The winner of this year’s Gerhard Meinzer Summer Scholarship is Sarah Ross, a student at Fallston High School. Sarah is an honor student as well as a member of the International Thespian Society and the Fallston Dance Company. She has chosen to study in Bonn this summer. She will live with a German family and study at a German high school. Eleanor Young, the winner of the 2015 Gerhard Meinzer Summer Scholarship, presented on her trip outside of Leipzig, Germany. Eleanor is a student at North County High School. She showed pictures of her host family, school friends, and the many places they visited. She loved Berlin, but was especially fond of Dresden. Lauren Beckjord, the winner of last year’s AATG Summer Trip, also gave her presentation. Lauren agreed with Eleanor that the culture shock was more than just the language difference, but it was still a great experience. For entertainment during the ceremony, a member of the Maryland Lyric Opera, Matthew Woorman, and former German student at The Catholic University of America, sang several opera selections. Thanks to Marian Graham, the AATG Chapter Testing Chair, who organized the event on a wonderful program. She called out the names of this year’s high school student winners. For the past events, visit the newsletter archive and our electronic newsletter archive. AATG -MD member Cora Hofstetter has been chosen as one of the 2015 German Embassy Teacher of Excellence Award recipients. The award is given annually to three educators who are new to the profession and have helped grow the German program at their schools. Ms. Hofstetter emphasises learner-centerd instruction and learning through group problem-solving. She has also organized an exchange with Bremerhaven, Germany with the help of members of the German Society of Maryland. Ms. Hofstetter teaches German and Spanish at North County High School in Glen Burnie, Maryland. 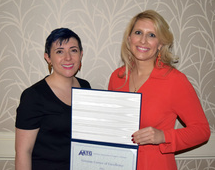 Ms. Hofstetter would like to thank the board members of the AATG Maryland-DC Metro chapter for their nomination for the award and for all of their support. Once again this year, the Chapter joined forces with the German Society of Maryland to honor those students who excelled in their performance on the AATG National German Exam. In 2014, the AATG inaugurated the new format for the NGE. Students in Levels 2, 3 and 4 were tested with authentic reading and listening materials to measure their ability to use their German skills for communicative and interpretive tasks. 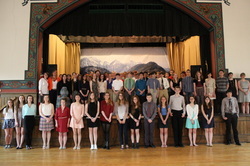 On Sunday, May 18, the Chapter and the GSM welcomed 64 students from area schools who scored in the 80th percentile and above to the beautiful and historic Adlersaal of the Zionskirche in Baltimore, Maryland to celebrate their linguistic accomplishments in German with their teachers and parents. Claudia Bornholdt, President, and Deborah Mifflin, Testing Chair, presided over a joyful and enjoyable afternoon with over 200 students, teachers and parents in attendance. Highlights included the recognition of two of our chapter students, Jennifer Hu from McDonogh School, and Brent Strong from Fallston High School, who each were awarded a four-week Summer Study Trip to Germany through the Pädagogischer Austauschdienst (PAD). Not only were the students showered with goody bags with prizes from the German Embassy and the Goethe Institut, but they also received a Certificate of Merit from the Chapter and a generous monetary award from the German Society. Other supporters of the event included the Swiss Embassy, the Austrian Embassy and the German Information Center. This year, the awards ceremony was enlivened by the delightful Alpine Volksmusik of Tom Leoni and Ian Hargreaves as they played several polkas and created a festive mood for everyone in the audience. For pictures and the full program, visit our chapter facebook album. In addition, the German Society presented this year’s winner of the Gerhard Meinzer Summer Study and the GSM College Award. See the German Society of Maryland for pictures and article. Congratulations to Craig Childers of the Goethe-Institut Washington for receiving the AATG Maryland-DC Metro Chapter's Award for recognition and appreciation for outstanding contributions to the field of teaching and studying German at the Teacher Immersion Day on March 23, 2014 at the Goethe-Institut Washington . We are all very grateful for Craig's support at various conferences and through Goethe-Institut initiatives! Several of our chapter’s members were recently elected to important positions in the AATG. Since January (2014), Mohamed Esa (McDaniel College) is our new AATG President. He will hold this office for two years. Hal Boland (Heritage High School, Leesburg) was just elected as AATG Vice-President. He will succeed Mohamed in 2016 as the next President. In a third leadership positions on the national level, Deborah McGee Mifflin (Johns Hopkins) now serves as the representative for the Central region, to which our chapter also belongs. In this capacity, she holds a seat on the AATG Executive Committee. Congratulations to our members and much success in their new offices! At the ACTFL conference in Orlando November 2013, we also celebrated the teachers and German program of Robinsons Secondary School in Fairfax, VA who were selected as a 2013 K-12 Center of Excellence. Congratulations to all of you!